With 8 festive gift bags, coordinating tissue and raffia for bows, this 40-pc. Cardinal in Evergreen gift bag set is your secret for quick, affordable wrapping that’s always perfect! Convenient for generous givers and last-minute shoppers, the stylish set gives even the smallest gift that special touch that shows you care. 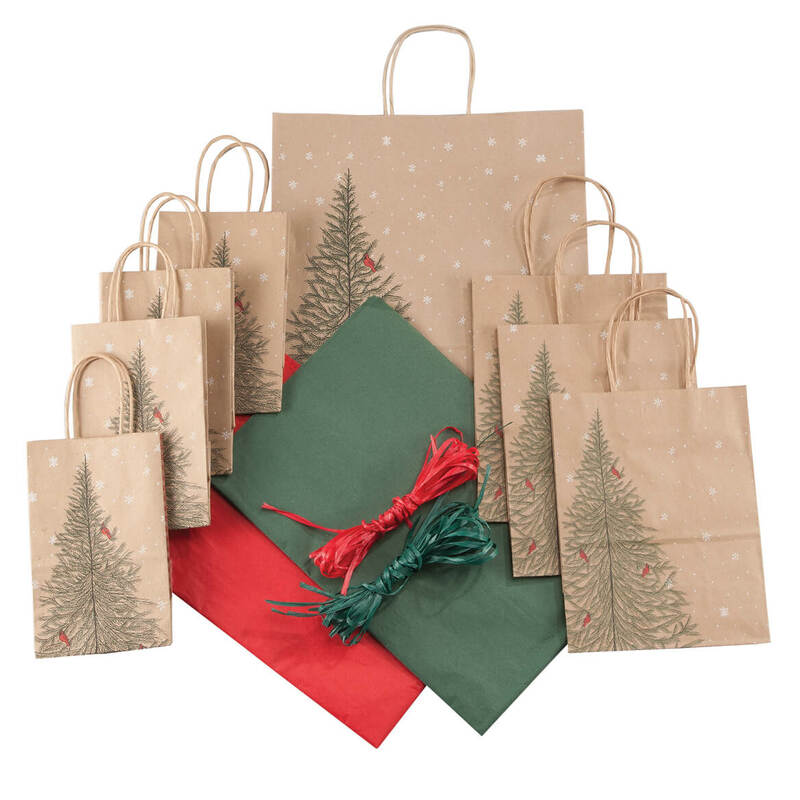 Set of 40 includes: 4 small gift bags (5 1/4″ x 3 1/2″ x 8 1/4″), 3 medium gift bags (8 1/4″ x 4 3/4″ x 10 1/2″) 1 large gift bag (13″ x 7″ x 17″), 20 sheets of tissue in red and forest green (20″ x 24″) and 12 strands raffia in red and hunter green (30″ long). With 8 snowflake gift bags, coordinating tissue and raffia for bows, this 40-pc. 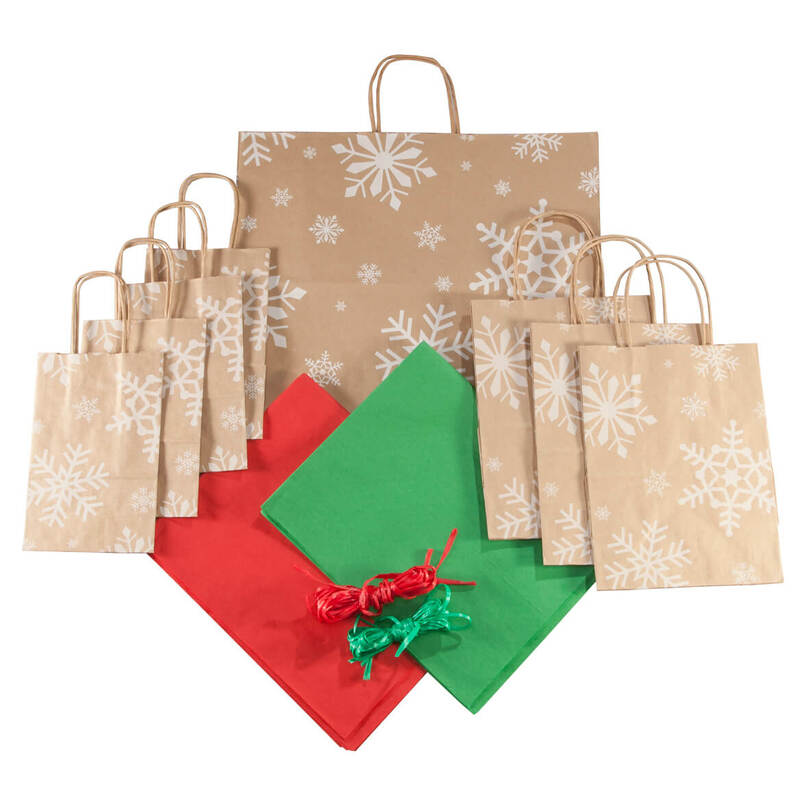 snowflake gift bag set is your quick, affordable gift wrap solution! Keeping you well stocked and ready for last-minute gifts that always look great, the stylish set gives even the smallest present that special touch reflecting your thoughtfulness. 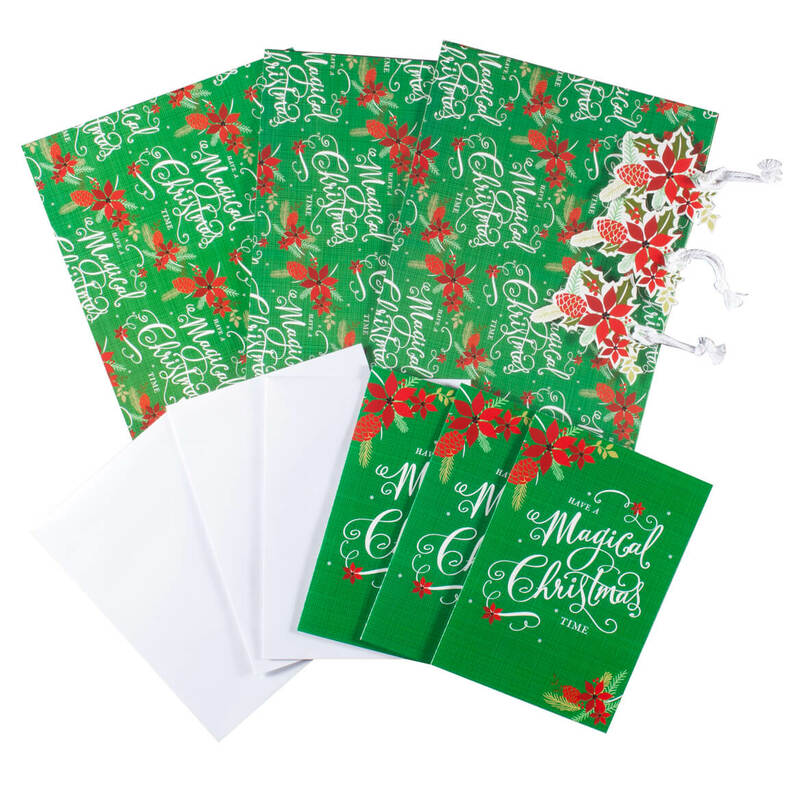 Set of 40 includes: 4 small gift bags (5 1/2″ x 3 1/4″ x 8 3/4″), 3 medium gift bags (8″ x 4 3/4″ x 10 1/2″) 1 large gift bag (16″ x 6″ x 13″), 20 sheets of tissue in red and kelly green (20″ x 24″) and 12 strands raffia in red and kelly green (30″ L). 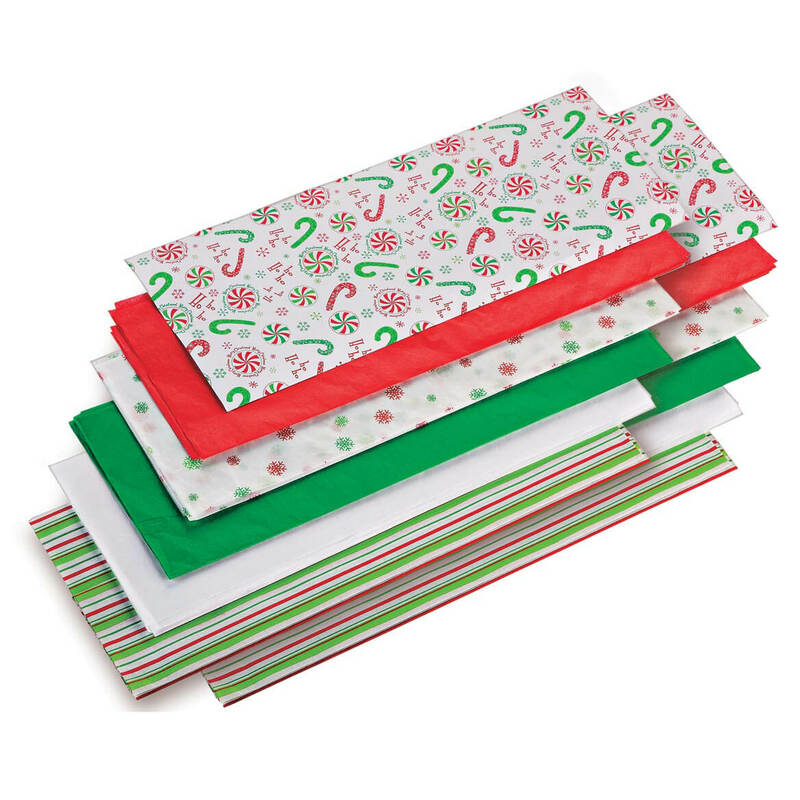 The giving is easy with this big, bright roll of boxed Christmas gift labels! 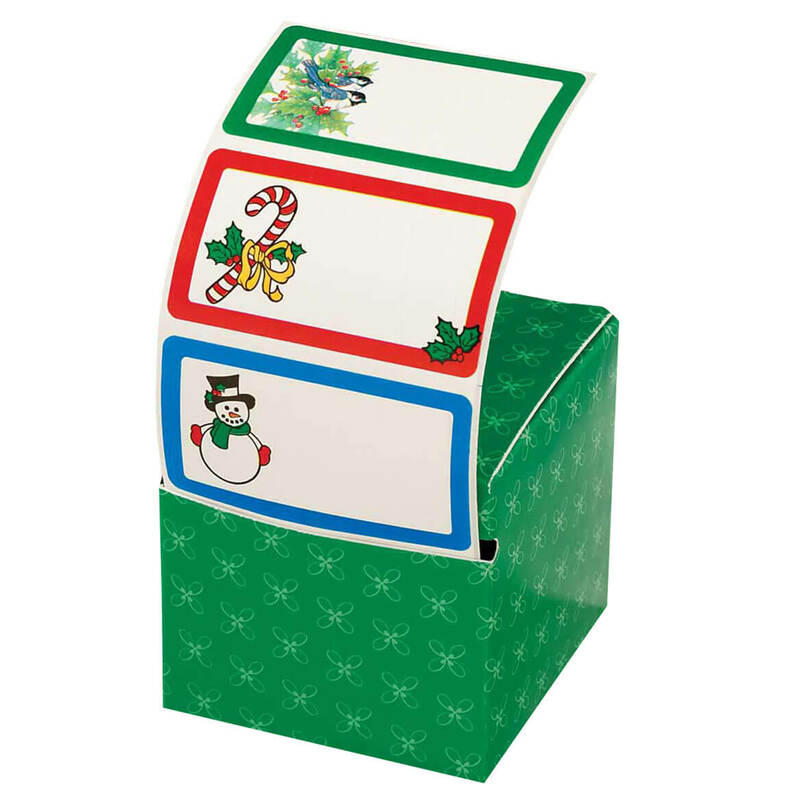 Tucked inside its own dispensing box, the generous roll of 120 Christmas label stickers includes 10 merry designs. Christmas gift tag stickers are self-adhesive. Measure 2 1/2″ x 1 3/4″ each. White gift boxes make your gift wrapping easy and beautiful. It’s simple when you have an assortment of gift boxes always at hand. 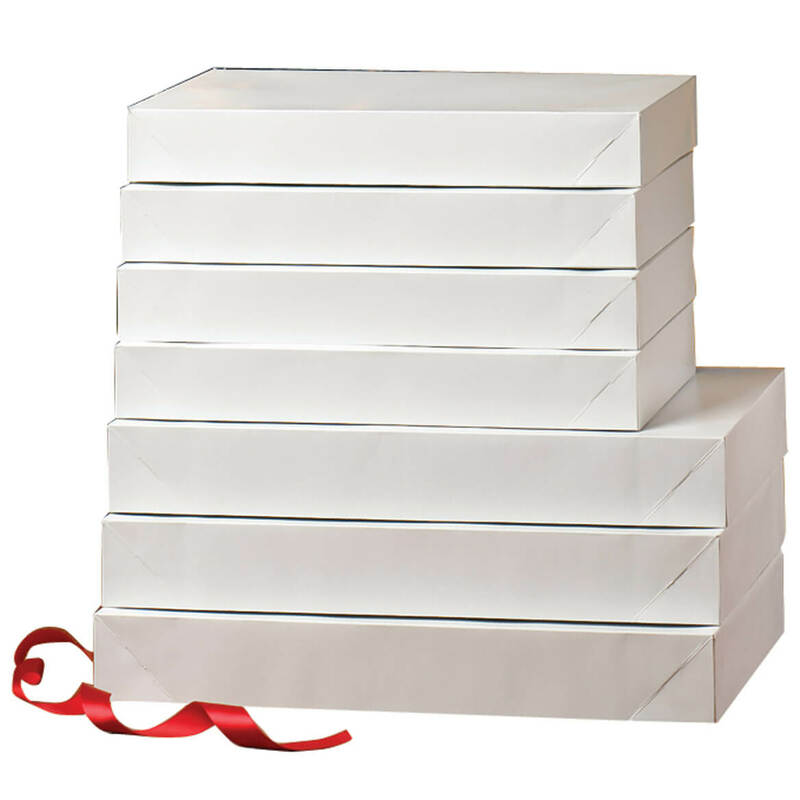 Folding white accessory gift boxes are available in a set of 4 shirt boxes (11 1/2″ x 8 1/4″ x 1 1/2″ each), or 2 robe-size boxes (17 1/4″ x 11 1/2″ x 2 3/4″ each). 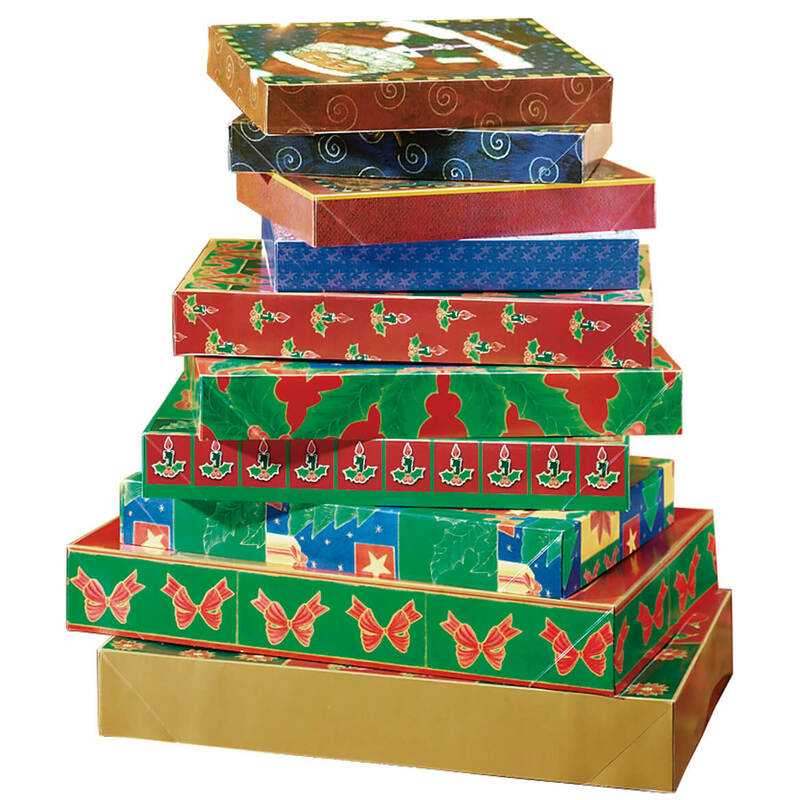 Christmas gift boxes eliminate hurried wrapping! 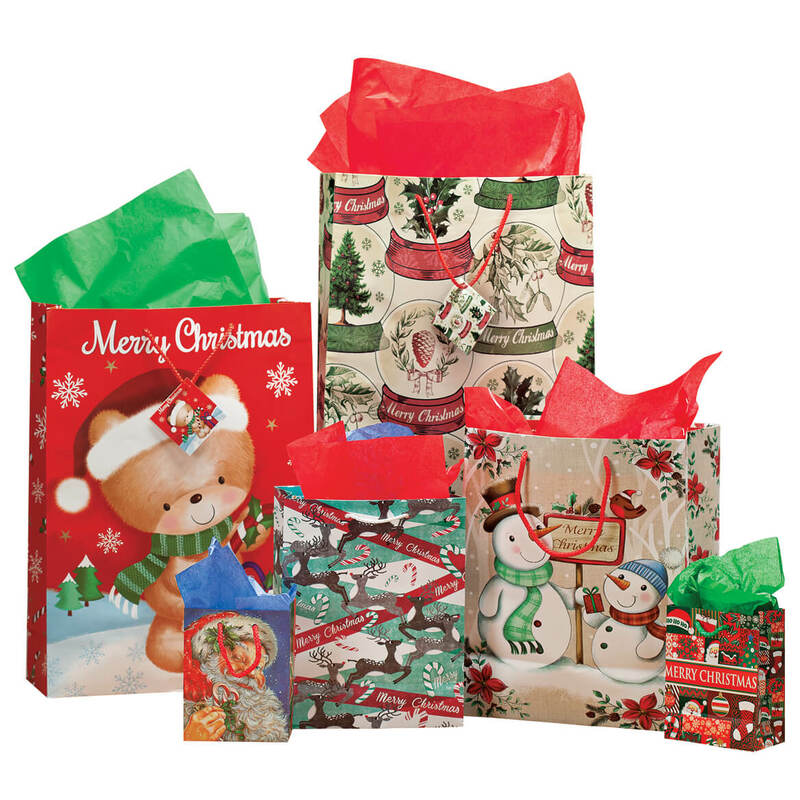 These good-looking Christmas gift boxes with lids are pre-printed with an assortment of holiday designs. Assorted colors; we’ll choose for you. Entire set will be same design. You get 10 in all: 4 lingerie (1 1/2″ x 8″ x 11″), 4 shirt/blouse (1 7/8″ x 9 1/2″ x 14 1/4″), 2 robe/sweater boxes (2 1/2″ x 11″ x 17″). Tissue paper makes Christmas creativity asnap. Wrap packages, line baskets, looselycrumple into bowls—it always looks great.You get 122 total sq. 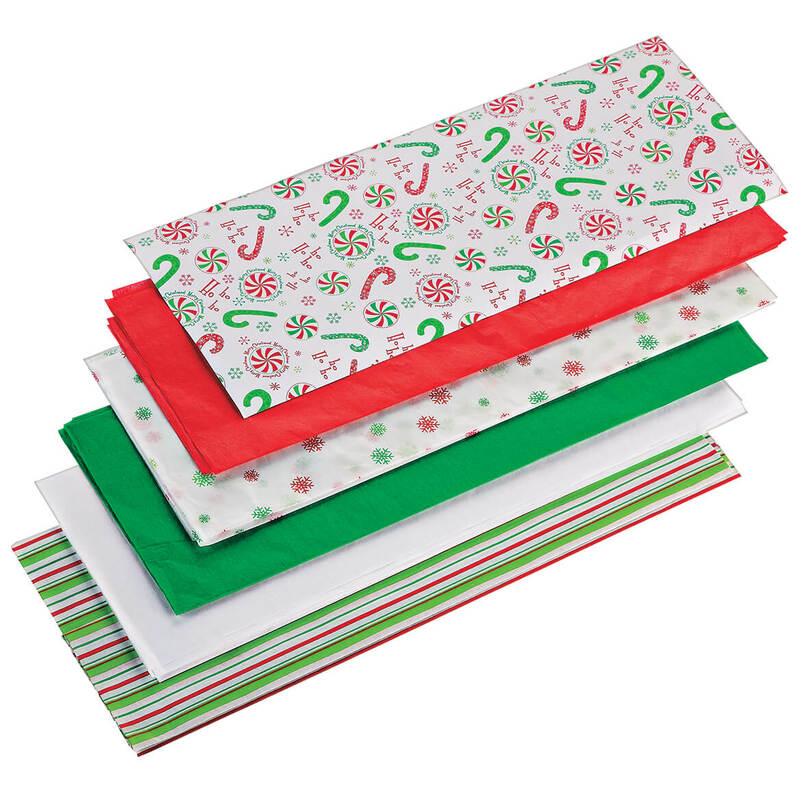 ft. of holiday tissue paper — 44 sheets: 28 white, eight seasonal colored designs, four solid red, four solid green. 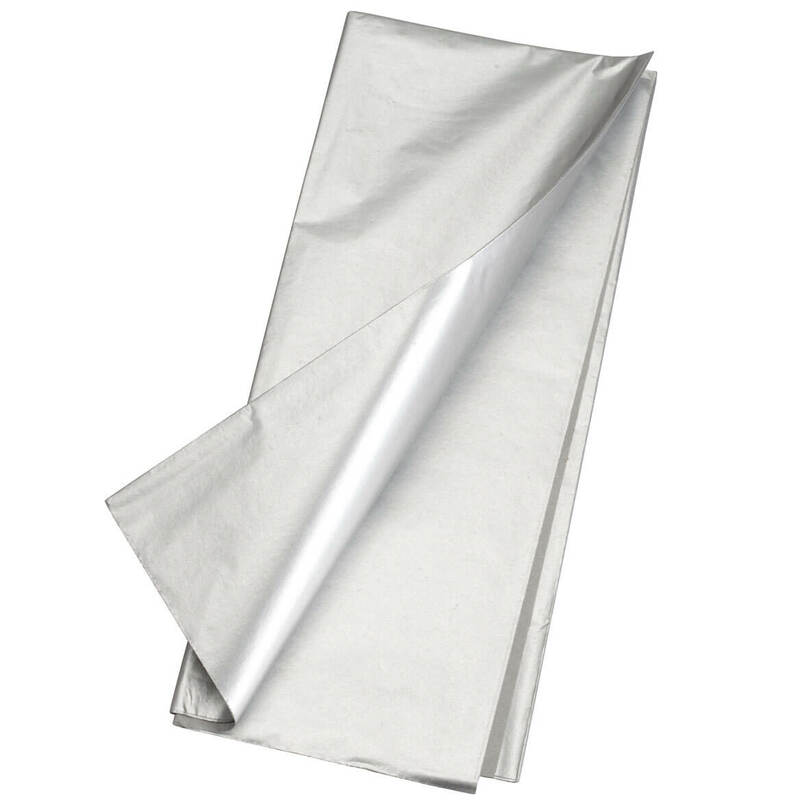 20″ x 20″ sheets. Tissue paper makes Christmas creativity a snap. Wrap packages, line baskets, loosely crumple into bowls—it always looks great. You get 244 total sq. ft. of holiday tissue paper — 88 sheets: 56 white, 16 seasonal colored designs, 8 solid red, 8 solid green. 20″ x 20″ sheets. Why wrap, when our Christmas gift bags are so attractive, fast, and economical? Bags are heavyweight paper, with nice string handles, and a great value—you’d pay far more in stores. You get 10: 3 extra large (15 1/2″ x 11″), 3 large (12 1/2″ x 6″), and 4 medium (9 3/4″ x 5 1/2″). Quick, easy and affordable … these flat gift wrap kits include everything needed to wrap 3 gorgeous holiday gifts! Each 12-pc. kit includes 3 sheets of wrapping paper in the same festive design, (each 19 5/8″ x 27 1/2″ sheet wraps 1 shirt box), 3 gift tags plus 3 greeting cards and 3 white envelopes (4 3/4″ x 6 1/2″). Choose from 2 classic holiday designs: Magical Christmas with card message “Hope you have the most wonderful season ever” or Poinsettia with card message “Wishing you every happiness this Christmas”. Specify style: Magical Christmas or Poinsettia.